Kimchi. 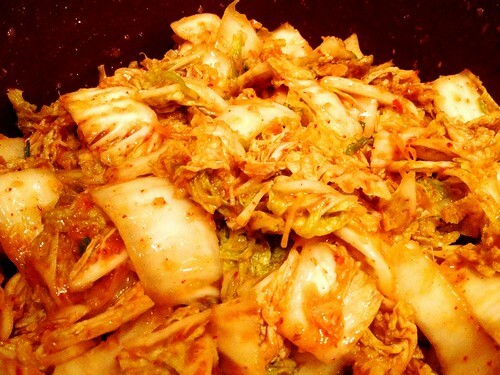 Practically the national dish of Korea, this potent pickle is pungent, sour, spicy and unnecessarily delicious. It works well as a condiment or side dish, in stews and curries, with rice and noodles, and even in a sandwich or bun - in fact, a kimchi hotdog seems to be de rigueur these days. Till recently, I've been lazy and got packets or tubs of the stuff from Oriental supermarkets, but I discovered that it's both cheap and easy to make yourself. This is a good thing as I recently had to make a shed-load for my Momofuku tribute dinner Lunchy Peach. The recipe looks long but I wanted to show you all the steps - it's really straightforward. And you can tweak the flavours (saltier, sweeter, sourer) so it tastes even better than shop-bought. (Burmese) shrimp paste, similar to belacan, is my secret ingredient for extra umami - other recipes add chopped-up oysters, dried shrimp or squid, but you could do without and just ramp up the fish sauce. It will stink out your house, but it's so worth it. And at this time of year, it's one of the best foods to blast away a cold. Tupperware or jars with screw top or clip lids totalling ~ 5 litres capacity. 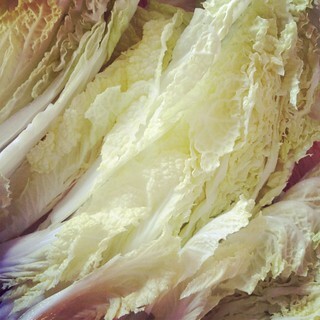 Wash the Chinese leaf and then cut into chunks about two inch square. Soak in a basin of cold water with the salt for an hour. 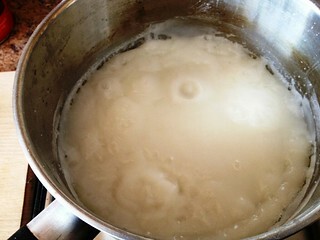 Meanwhile, mix the glutinous rice flour with the sugar and 750ml cold water in a saucepan and then bring to the boil and stir till it bubbles like a cauldron and becomes a translucent paste. Leave to cool. 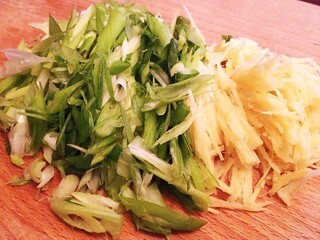 Shred half the spring onions (both white and green parts) and one piece of ginger into slivers about 2 inches long. Mince the garlic, the other piece of ginger and the rest of the spring onion (I use a mini chopper). 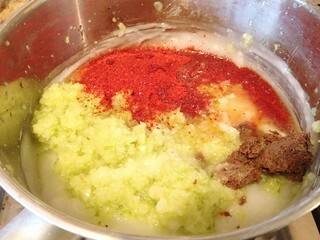 Add the minced veg to the cooled rice paste, then whisk in the chilli flakes, fish sauce, and shrimp paste. Lastly add the shredded spring onions and ginger. This is your kimchi marinade. Drain and thoroughly rinse the Chinese leaf with cold running water (it will have shrunk down a little) and then squeeze the leaf to get rid of as much moisture as possible. 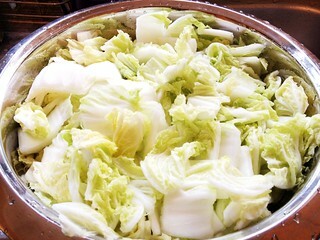 Then, using the same basin in which you soaked the leaf, mix the Chinese leaf with the kimchi marinade, coating it thoroughly. Taste a little and adjust if necessary, eg add more fish sauce or a little sugar, but bear in mind that the flavours will develop and get stronger over time. You can actually eat it straight away, but why would you? 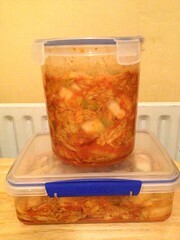 Press down firmly in the Tupperware or jars and seal, making sure you leave a couple of inches of air space above the kimchi - as it ferments, gas will be produced and you really don't want an explosion. Keep at room temperature for about two days (one day in warm weather) and wait for the fermentation to start. You'll know it's worked when bubbles start to form on the surface and it smells sour, and you may even hear a small hissing noise. 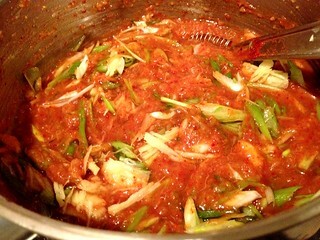 Then store the kimchi in the fridge and let the flavours develop - I think the optimum time is a week to eat "as is", and a fortnight for cooking with. 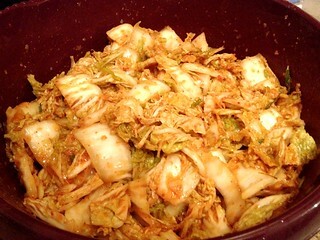 Eat the kimchi within a month (although you'll probably finish it sooner like I did). *Korean chilli flakes (gochugaru) are also labelled Korean red pepper, red pepper flakes or hot pepper powder in Oriental supermarkets. It's a bright red rather than a rusty colour. Turkish red pepper flakes are a good substitute, but not standard chilli powder or crushed chillies. I got my Korean pepper flakes from Centrepoint Food Store in London, but you can buy them online at Sous Chef. First time here. Nice blog. 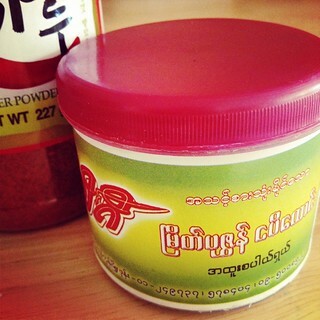 Could you substitute the Burmese shrimp paste (belacan) with Thai shrimp paste? Hi there and welcome! Yes, you can substitute with Thai or the various other types of Asian shrimp paste (eg Malay), so long as you pick one that's dark and almost grainy as those are the strongest and sweetest. Given my propensity for fermentation, both personal and edible (not forgetting glugable) I have yet to make my own kimchi. I must correct this. 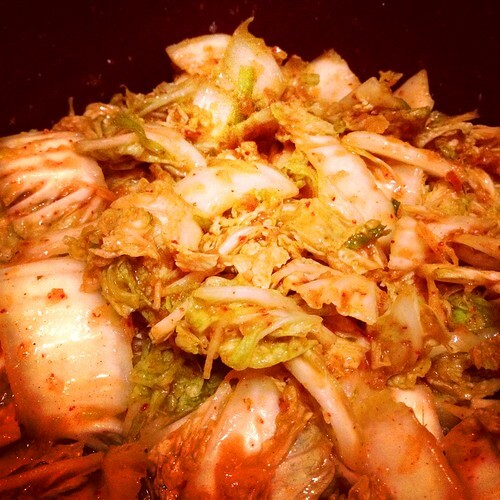 Making your own kimchi is so easy - though I overpacked and got exploded... I still haven't experimented with other vegetables yet. @Food Urchin - It's good stuff. Re your personal problems, Wind-eze might help? @Lizzie Mabbott - I *knew* I remembered someone's actually exploding - brilliant! Never tried it in an omelette - thanks for the tip! 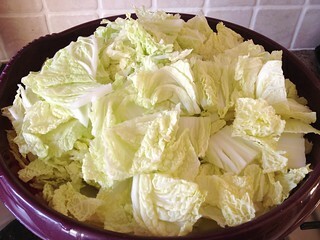 I'm making kimchi today! Some recipes omit the rice flour paste. What does it do? It aids the fermentation process - I'm not sure of the exact chemistry behind it though. Lots of Burmese pickles are made with rice flour or even cooked rice. Rice is packed full of carbs and you need carbs for fermentation, so the rice paste gives it an added boost!